After the absolute gut punch of an ending in episode 1, Faith, Smoke and Mirrors picks up not long after. For obvious reasons, I can’t and won’t go into details, but the story takes some pretty surprising turns right off the bat, and within 10 minutes, everything I thought I knew was called into question. This makes reviewing episodic content so incredibly difficult; since there here isn’t a complete story to analyze and critique, what’s left is the actual game itself, and quite honestly, it’s a bit of mixed bag. 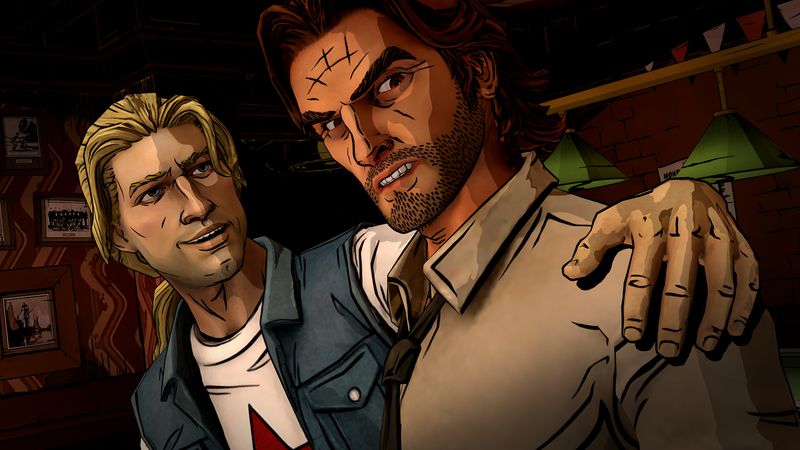 Visually, The Wolf Among Us is as strong as ever. Each frame is so full of color and well drawn environments and characters, that it’s easy to think I was simply playing a motion comic. The voice acting is top shelf, as expected, and the narrative is incredibly well written and consistently surprising. I’m actively interested in the mystery here, and dying to solve it and see what happens next. What really makes this game stand out though, as is the case with Telltale’s Walking Dead games, is the way each scene plays out and how you create your own version of Bigby and the story. For me, Bigby has a softspot for the ladies, tries to tow the line, but will absolutely be hard if he has to be. He has no qualms smashing up a place in order to get answers, but will always treat moments with a softer touch as I felt it was genuinely in his nature. This adds so many dimensions to the character, and is absolutely why I love playing Telltale games. The source material, Fables, also lends itself to meeting a ton of interesting characters and seeing New York City through the eyes of storybook fable characters is always a thrill. It’s a rich and interesting world and the central mystery is one of the best I’ve ever experienced. Narratively, there is a lot to enjoy here and it is my main thrust for continuing the experience. Part of the fun is running into the “real world” versions of famous fable characters. Like Jack, from Jack and the Beanstalk. 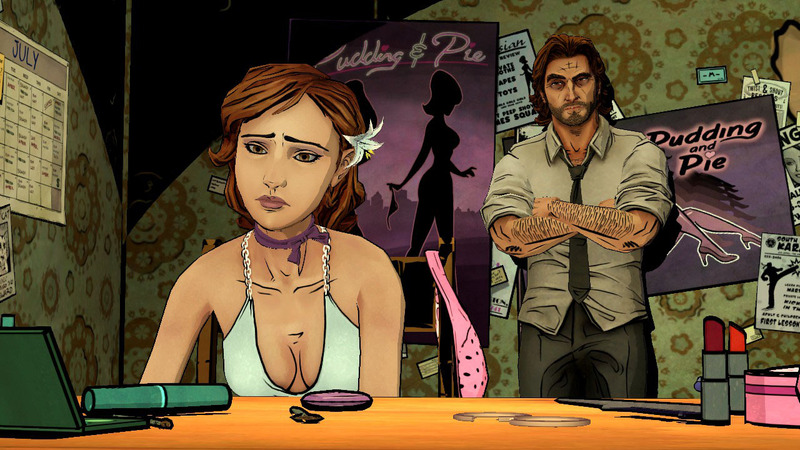 Unfortunately The Wolf Among Us runs horribly on Xbox 360. Absurd load times, freezing between scenes, even during high-tension moments which all works to really, really kill the momentum. During a particularly hairy (I’m not sorry) fight scene the screen froze for more than 10 seconds. Had I not been able to bring up the Guide Screen, I would have thought my 360 had crashed. I don’t pretend to understand the technical reasons for this, but I do know that I have played far more visually taxing games where this isn’t an issue. Either way, it happens a lot here and it’s always terrible. The gameplay, such as it is, is very much like Telltale games of the past and if you’ve played episode one, nothing new is introduced. In fact, I would say Smoke and Mirrors lacks the surprisingly thrilling fight scenes of the first game. There are a few, but they are comparatively brief, and not nearly as intricate or expansive as those found in Faith. I’m sure this is by design because this episode is much more about investigating what is going on rather than getting into knock down, drag out fights. What we have here is a lot of walking around, looking at clues and making sure you’ve done everything in the scene before you move on. Unlike older games in the genre, it is impossible to get stuck, so what winds up happening is a lot of answering questions and choosing conversation options that will lead to a reaction from another character. As is my experience with The Walking Dead, every choice you make will most likely pay off at a key moment, but unlike Faith, there are no either-or options that will force the scene to play out differently. I’m very curious to go back and replay the episodes again and make different choices just to see what happens. I won’t spoil who this is, but it’s quite amusing. At the end of the day, The Wolf Among Us’ best hook is its story and seeing how it all plays out. For me, it’s a great hook because I love a good mystery and great characters, but anyone looking for challenge or the head scratching puzzles of more traditional adventure games should probably pass on this or deduct a point or two from my score. Personally, I can’t wait to see what happens next. I just hope the experience isn’t quite as marred by technical issues next time. Sean played The Wolf Among Us: Smoke and Mirrors on the Xbox 360. A code for the game was provided by Telltale for review purposes.